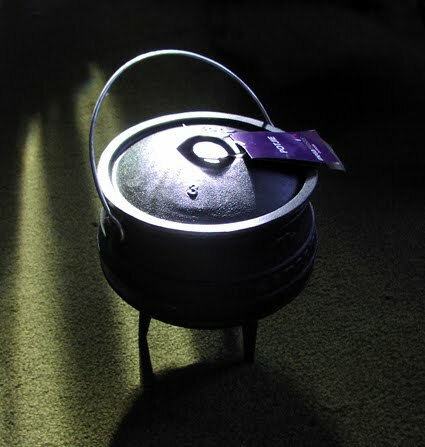 A bad witch's blog: Shopping: I've Bought Myself a Cauldron! Shopping: I've Bought Myself a Cauldron! Thanks very much indeed to everyone who answered my question about where to buy a large cauldron. The Country Witch suggested I buy a No 3 Potjie Pot - which is cooking pot of a type that is very popular for outdoor cooking in parts of Africa. And then a friend reminded me that the lovely lady who trained us both as witches many years ago also had a large African cooking pot that she used as a cauldron. I checked on Ebay, Amazon and Pagan Magic, but they only had small and medium-sized caudrons and no Potjie Pots. After a bit of web searching I came across The South African Shop, which has Potjie Pots in several sizes. I ordered one, and it arrived promptly - you can see it in the picture above. I'm very much looking forward to using it!